Yesterday, the BLS announced a slight drop in unemployment. As always, it helps to look at the data, not just the headline number. Unemployment dropped, in part, however, because the workforce itself is smaller – that is, the “labor force participation rate”. We want to see the black line, below, rising. This is a recession lagging indicator and generally rises after the downward trend of the recession has ended. At this time, the employment-population ratio is at a level seen back in 1978. The participation rate itself is indicated with the bright blue line – that too is still falling. 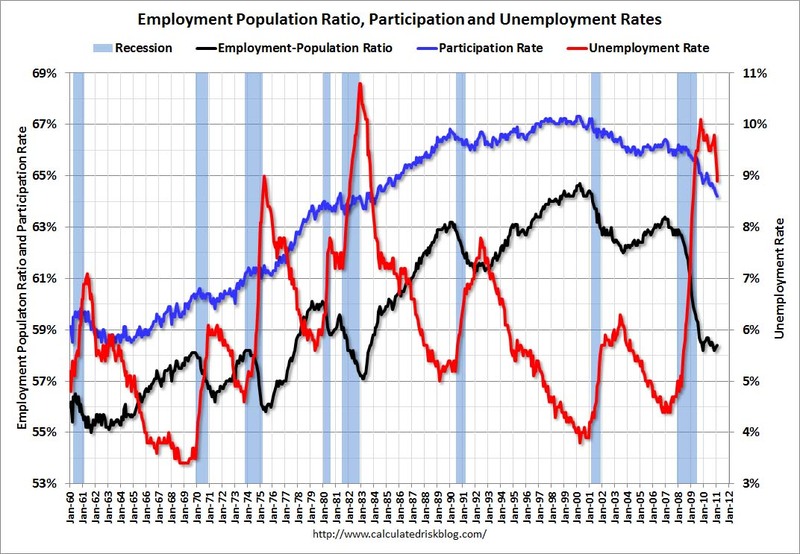 The unemployment rate can go down, in this situation, because in part, the participation rate is falling. In English, that means fewer people are looking for work, perhaps because they have given up for now. A lower participation rate also means that our economy is not functioning at its potential maximum capacity – literally, we have resources sitting around not being used. On the other hand, we need to look at the detailed breakdown of what jobs are increasing and which are decreasing. I have not had time to do that. I have heard that factory and construction jobs have increased, which would be good. Washington’s Workforceexplorer web site will have updates twice in the next few weeks with local data. Average work hours, per week, remain low. This means more people have part time jobs or reduced work hours – More information on historical average work weeks is here. Seasonally adjusted hours series from the Current Population Survey.